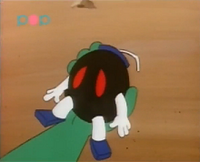 A Smell Bob-omb is a type of Bob-omb only seen in the Super Mario World episode "Born to Ride". During the episode, Yoshi wanted to join the Dino Riders. However, Yoshi needed to pass an initiation test to join the gang. One action was throwing a Bob-omb at one of the houses in Dome City. Yoshi was hesitant to throw it, so Lulu, a member of the Dino Rider gang, took his arm and forced him to throw it. Despite looking like an ordinary Bob-omb, it released a stinky green gas. Afterwards, the people inside the house get out. This page was last edited on December 12, 2018, at 21:39.